Patriotic treats for your your pup. We are proud to be Americans. 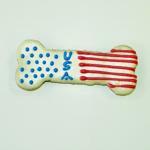 With our selection of Patriotic treats your pup can be as proud. We use natural and organic ingredients in our treats and ice them with a tapioca based icing, Soft-Gel paste and gum arabic (an edible glitter safe for dags).